This game is beautiful. If I blame the limitations of the Xbox 360 for many of the drawbacks of DA2, then at least with DA:I we get an expansive game with amazing graphics that finally gives my GTX 970M something to do. Maybe the environments aren't quite up to the standard of the Witcher 3, but it is miles ahead of the previous two games. In many other aspects, DA:I synthesizes the best elements of DA:O and DA2, particularly in terms of combat and storyline. 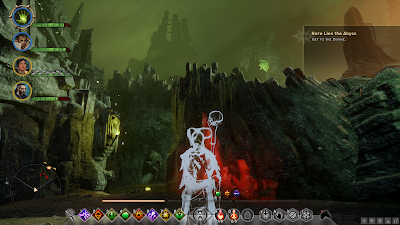 Combat is even more dynamic and immersive than DA2, but they've also introduced the option of a tactical view, which helps make combat more strategic. I switched between both, depending on how difficult the fight was and how many enemies I was facing. 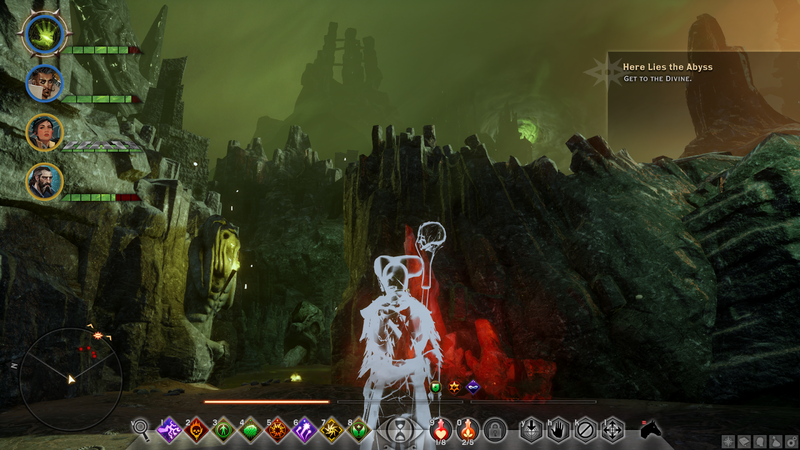 Some of the encounters are more difficult than DA2, and several times I faced a Total Party Kill. As for the story, more will be said below. It took me 84 hours for my first playthrough of the main storyline (not including the 3 expansions), so almost exactly the same as DA:O and twice as long as DA2. The beginning of the game is quite different from the previous two: it starts in the Fade, where you are fleeing a swarm of arachnids. 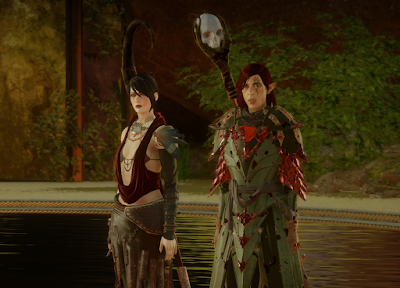 You awaken in the Frostback Mountains, where you are captured and interrogated by Cassandra & Leliana, the same pair who were interrogating Varric in the framing narrative of DA2. Glowing, green sparks emanate from your hand, which appear to be linked with the massive breach in the sky. You might be the only one who is capable of closing the breach and saving the world, but you have no memory of who you are or how you got there. The premise didn't really appeal to me the way that the two previous games had. Consequently, it took me a while to warm to this game. After the prologue, there are two main aspects to the game. 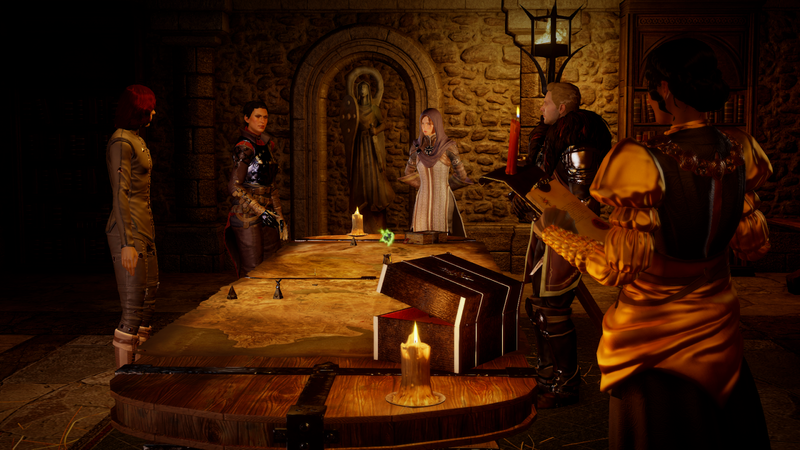 In the war council, you select which of your three advisers to send on various missions throughout Ferelden, Orlais & the Free Marches. Leliana is the spymaster, Cullen commands the troops, while Josephine is the diplomat (representing subterfuge, force of arms, and political maneuvering, respectively). Some of these missions open up areas of the map for you to explore yourself, accompanied by 3 out of up to 9 companions. The second aspect of the game is these Star Trek style "away missions," which mostly involve a bunch of side quests. Structurally, this has some similarity with DA: Awakening, NWN2: Storm of Zehir or even BG2: Shadows of Amn. However, the way that your command of the Inquisition is handled is even better than those games. As you gradually build your power and influence, new options open up to you. The fast travel system means that it is rarely a problem to return to your base as the need arises, which was such a pain in BG2. The map is divided into 16 individual locations. This is less immersive than the Witcher 3, where it is possible to ride from Crookback Bog in the south to the city of Novigrad in the north, then hop in a boat and sail to Skellige. However, by having these locations be much further apart, it is possible to include more variety. The deserts of the Forbidden Oasis, the swamps of the Fallow Mire, the snowy peaks of the Frostback Mountains, the wild seas of the Storm Coast, and of course the subterranean tunnels of the Deep Roads are all rendered in gorgeous detail. Each location is packed with enough engaging content to keep you going for several hours. Many locations are large enough that you need to fast travel to get around. You do eventually obtain a horse (or other mount), but there is little point in using it. Noticeable drawbacks are that there is no day/night cycle (unlike DA2), no dynamic weather, and you cannot go underwater without drowning instantly (so no underwater combat). As with DA2, you need to choose whether to support the magi or the templars. I chose to play a dalish mage, so my fellow magi were the obvious choice, especially after my awful experience with templars in DA2. 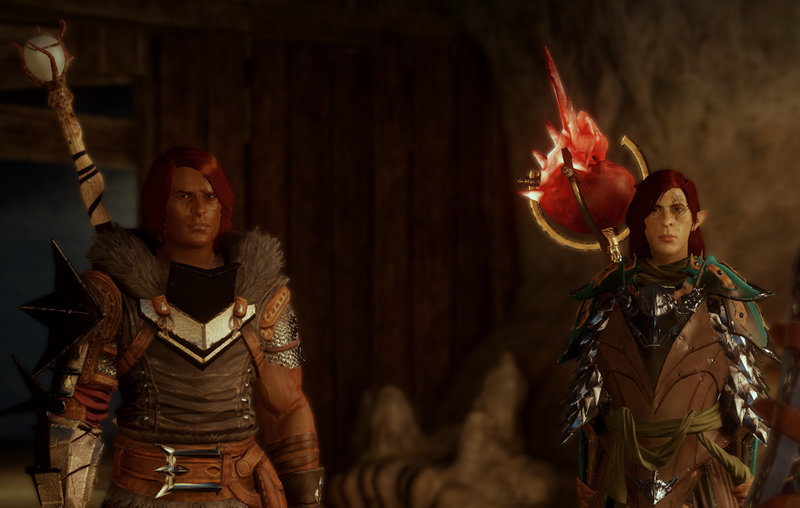 However, I was shocked to discover that the magi had secretly formed an alliance with Tevinter. Meanwhile, the templars had been fooling with red lyrium, so they were no better. Even the Grey Wardens had been corrupted from within. The villain behind all of this is the Elder One, Corypheus. A member of the seven Magisters Sidereal, he was introduced in the Legacy expansion for DA2, which I haven't played. However, I had met another of his kind in the Awakening expansion for DA:O, which featured the Architect. To recruit the magi, the Inquisitor must first defeat the agents of the Tevinter Imperium. These are not just members of the Magesterium, but of a secret sect known as the Venatori. They are led by Magister Gereon Alexius, who has taken over Redcliffe Castle. 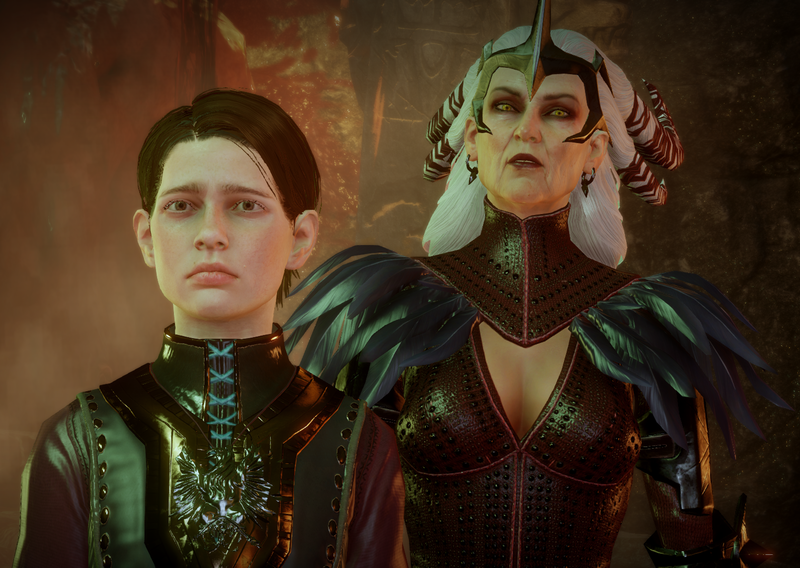 His son Felix and a Tevinter mage, Dorian, explain that Alexius has been manipulating time. When you confront him, he activates an amulet that transports you and Dorian into the future. Under his control, Redcliffe Castle has become an apocalyptic hellscape. You need to fight your way through the castle, rescue all of your companions, and defeat Alexius to return to your own time. You then have the choice of whether to offer the rebel mages an alliance, or conscript them as your prisoners. In either case, you now have enough magical power to close the rift in the sky. The first act of DA:I concludes with a real Empire Strikes Back moment, as the Inquisition is forced to abandon their base and flee from the overwhelming military might of the Elder One and his pet dragon. With the knowledge of what happens if Corypheus is not stopped, you need to alter events so that the future that you glimpsed does not eventuate. This is a great way to provide motivation for the player, which was somewhat lacking up to that point. You attend a ball at the Orlesian Winter Palace in Halamshiral to prevent the assassination of the Empress Celene Valmont I. This section of the game reminded me of Casanova: The Duel of the Black Rose, a 2001 game by Arxel Tribe. I could happily play an entire game like this, which is why I am so eagerly anticipating the Blood & Wine expansion for the Witcher 3. The Winter Palace is a larger and more complex area than Val Royeaux, which is supposed to be the capital city. The city of Amaranthine in Awakening was more impressive than Val Royeaux, but the Winter Palace is unique for the Dragon Age series. Varric sets up a meeting between you and Hawke, your player character from DA2. Hawke & Varric fought Corypheus before (in DA2: Legacy) and had believed that they vanquished him. You travel together to meet with Stroud, one of the Grey Wardens. Somehow, Corypheus has triggered the Calling, so that all of the Grey Wardens feel drawn to the Deep Roads. In desperation, Warden-Commander Clarel is planning some kind of blood magic ritual. You interrupt a ritual in progress in the deserts of southwest Orlais, discovering that the Grey Wardens have unknowingly allied themselves with the Venatori. You mass the forces of the Inquisition and lead an assault on Adamant Fortress to prevent the Grey Wardens from summoning a demon army. Unfortunately, the Venatori have a dragon on their side. During the battle, you instinctively open a rift into the Fade, pulling all of your companions (including Hawke & Stroud) through with you. The Fade is undoubtedly my favourite part of Dragon Age lore. In my opinion, this section of the game was even better than similar parts of DA:O and Awakening. 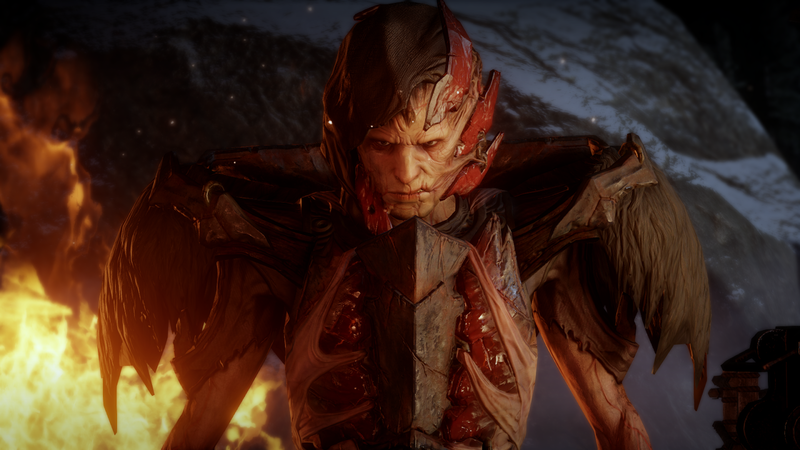 Having been twice defeated by the Inquisitor, Corypheus headed for the Arbor Wilds. Morrigan guessed that he sought one of the Eluvian artefacts in an elven ruin. When we caught up to him, we witnessed his death at the hands of an elven artefact. However, Corypheus transferred his spirit into the nearest Corrupted (darkspawn, Red Templar or Grey Warden), just like an archdemon. This is why the Grey Wardens had originally imprisoned him, at least until Hawke accidentally set him free. 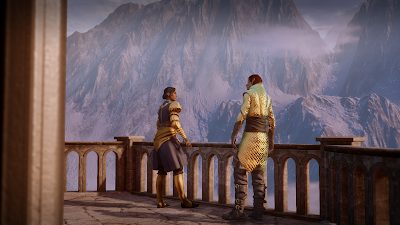 We fled inside the Temple of Mythal, shutting both Corypheus and his dragon outside. The guardians of the temple, ancient elves sworn to protect its secrets, offered me an alliance. Corypheus was after the Well of Sorrows, which contained all of the knowledge of the priests of Mythal. Morrigan sought this knowledge as well. I earned the guardian's trust and he permitted me to drink from the well instead of Morrigan. Too many times, she had already been economical with the truth. I couldn't entrust her with such an important part of the history of my people, when she would most likely keep most of it for herself. Corypheus finally broke into the temple, but too late to stop me. We fled through the Eluvian, back to Skyhold. The final showdown with Corypheus and his dragon is in the Valley of Sacred Ashes, where Corypheus has opened a new rift in the sky.